보은 법주사 동종은 1636년에 조성된 종으로 단룡과 음통을 갖춘 용뉴, 종견과 종구의 상대와 하대, 상대 아래 연곽(蓮廓)을 사방에 두고 9개씩의 연뢰를 배치한 전형적인 한국 전통양식을 따른 범종이다. 특히 상대 위로 높이 솟아 오른 입상화문대의 각 연판마다 불화상이 표현되어 매우 이례적인 특징을 보여주는데 이러한 특징은 유사한 시기에 만들어진 남원 대복사 동종(1635년)에서도 확인된다. 상대에는 뇌문과 하대에는 연화당초문을 유려하게 시문하였고 연곽과 연곽 사이의 종신 상부에는 연꽃을 지물로 든 보살입상을 번갈아 가며 4구 배치하였다. 종신 중단에 둘러진 두 줄의 횡선을 둘렀고 연곽 아래쪽에는 위패형 장식을 첨가하였다. 보은 법주사 동종은 17세기 전반 승장계 종들인 죽창―정우―신원―원응 작 삼막사 동종, 정우―신원작 영원사 동종과 무량사 동종, 정우―신원이 만든 것으로 추정되는 쌍계사 동종과 같은 계열의 종으로서 조선후기 범종양식 뿐 아니라 17세기 승장계 범종 연구의 좋은 자료이다. Made in 1636, the bronze bell of Beopjusa Temple in Boeun is regarded as one of the finest examples of traditional Korean temple bells. It features a dragon loop with a sound pipe, and a pair of decorative bands encircling the shoulder and mouth, in between which are lotus boxes, each containing nine lotus knobs. 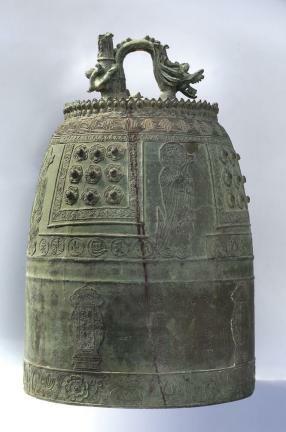 Among the bell’s unique features is a band of flowers carved in high relief on its top, with each flower petal containing a miniature Buddha image. The bell is regarded as a fine source of knowledge on the style of temple bells made during late Joseon and those made by monk-artisans in the seventeenth century.